By now, we all know I love a vision board. However, having never gotten around to making a new one after I moved to England, there has been a large, rectangular hole in my life just waiting to be filled. That hole has now been covered in an aesthetically coherent patchwork of Scandinavian interiors and golden retrievers, and today is the day we explore this together. 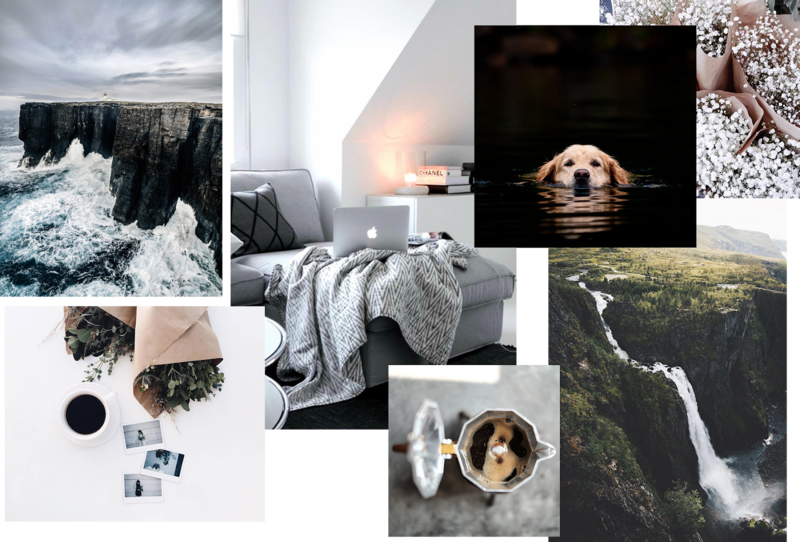 My new vision board is actually a metre long collaged pin board, which I will photograph at a later date, but for the sake of this post I've made a few mini mood boards to give you an idea of the overall feel. I've also made a Pinterest board containing most of my current vision board images here. 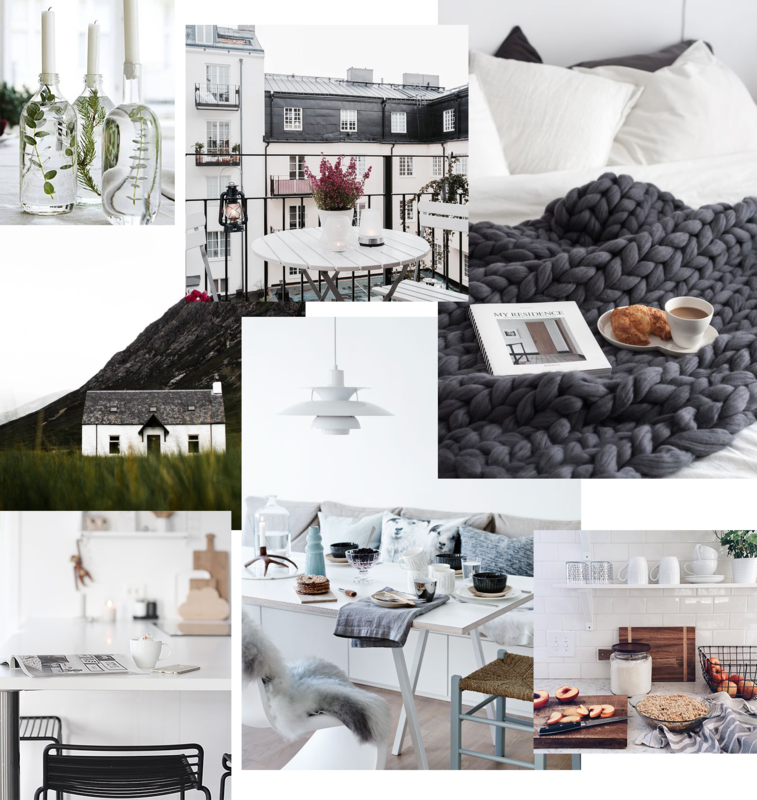 If this is your first encounter with one of my vision boards, I'd recommend giving one of my other posts (here and here) a browse so that you get the idea I'm going for. 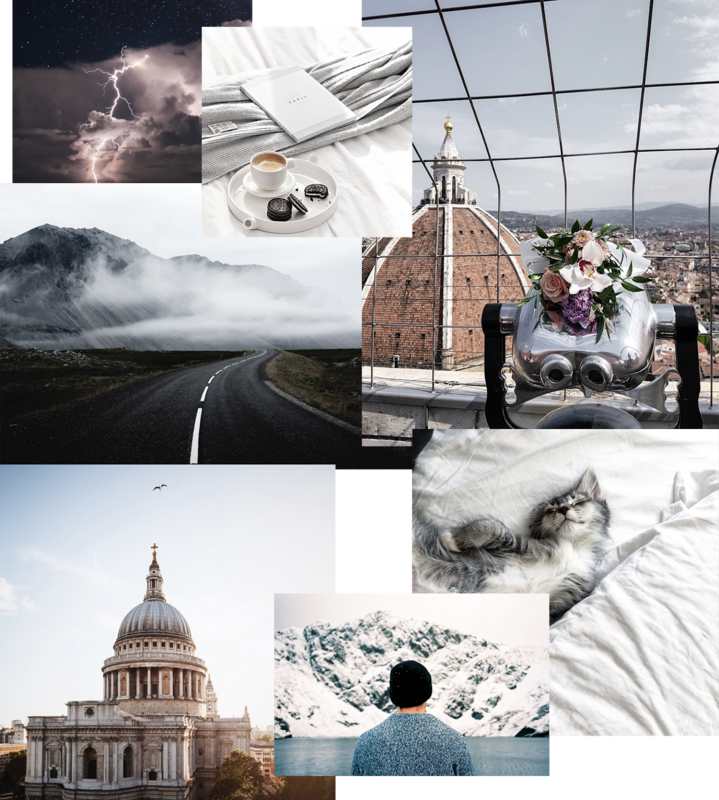 This is not a traditional vision board (that's on the list for slightly further down the line) but more of a visual representation of different vibes I'm inviting into my life, and a collection of images that make me feel motivated and inspired in one way or another. I think the theme of this board is quite intermediate; it's all about transition and setting a new tone for me to draw from while I recreate my life and get my head in the game. It's about taking the London-centric ideas I had and recollecting that focus in Australia. This season in My Life, one of the things I am focused quite strongly on is creating a sense of home and consistency. Will and I have put moving out into a new apartment on hold while I focus on building a business, but having that new space and being able to turn it into whatever we want is something that's very present in my mind, so there are a lot of calming interiors on my board. 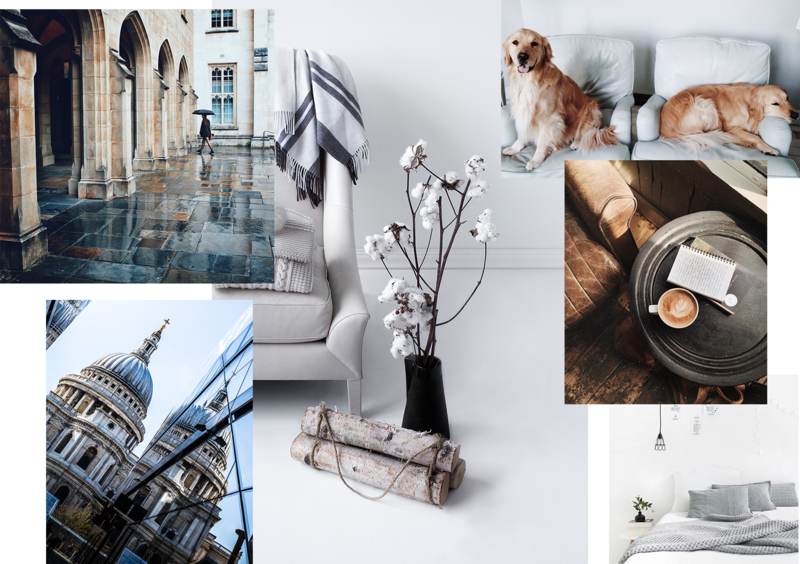 I have an actual interior inspiration board on Pinterest, which you can find here, so this isn't actually a strict representation of how I want to decorate, but looking at it reminds me of what it is that I'm working towards and makes me feel more motivated to get there A$AP. One thing I've noticed that has been dialled back on this edition of Inside My Brain is moody, rainy landscapes and other hygge-heavy imagery. I imagine these will come back into play when my brain switches back to a more creativity-focused setting rather than the organisational, productive one it's in now. There are a few homages here and there, for instance can't have a vision board without lightning and the occasional hillscape to set the tone, and the misty road in the first collage definitely appeals to a certain angsty, reflective part of my brain. The more I focus on these bits the more I'm starting to think maybe I should make another smaller board of exclusively things that set off the little lightbulb in my emotionally-charged-creative-motivation centre. Interesting how going through my current board is just giving me a list of more boards to make. Such is my entire life honestly, when I start one thing on my to do list and end up thinking of six more to add along the way. In a way this board acts as a thematic anchor to remind me I can still create what I want, despite being based back in Melbourne. That may seem odd considering the heavy travel theme, but I traveled just as much growing up here as I did when I lived in Europe, so it makes sense to me and doesn't detract from the message overall. The placement of each image is also something I did quite deliberately, for instance the rainy archways photo above is actually of Melbourne Uni, which I grew up next to and met Will whilst attending myself, so while it possesses the ambient je ne sais quoi I hold so dear, it also centres me in my physical surroundings. I put it right in the middle of the board, so that while the edges are photos of Venice or landscapes or more abstract things, the centre ties it all to my present. The interiors I've chosen are also slightly more lived-in than usual, in that they make me think of creating a space in which I can hang out with my friends and entertain on the reg. Separate, intentional spaces to spend time with people and to work are things I'm really excited to get stuck into creating as soon as we move, so they remind me of the positives that drew me back from London as well as what it is I'm working towards. One key point of difference between this board and my previous creations is the motivational quotes. They still exist, but I've changed things up a bit in that there are a few more vague yet evocative one-liners, and the way I've sourced them overall is completely new. In the past I'd just chuck in any generic quote that I stumbled across online and liked, but this time I went through my notes from a few books I've read so far this year (particularly productivity and mindset-based ones) and picked out the lines that spoke to me the most. Some of these are questions asked in the text, a few are more conventional quotes like 'Time management is life management' (which I'm very much living by at present), and one is just a full on 7 point list of how to set and achieve goals. 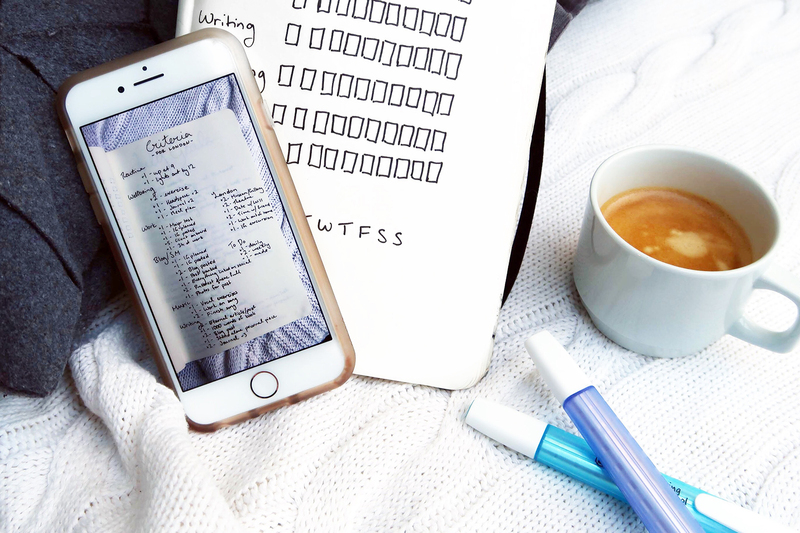 I think quotes are one of the parts of a vision board you should invest the most time into, because they're so specific to you as a person, and they are also one of the easiest ways to remind yourself to get back on task. Animals are also a recurring theme here, specifically golden retrievers and cats that look like Kus, aka Will's cat who is at present staying with his friend Ollie til we move out. The idea of having pets is something I equate with a real sense of stability, and even though we already live together, finally being in our own space with Calvin and Kus is going to be a big step. Additionally, I have been so obsessed with golden retrievers my entire life and haven't had one since I was 19, so the possibility of getting one is exciting on so many different levels I don't even know where to start, but I know I need to have a lot of things very sorted before that happens so it's something to visualise but also something to work towards. Good god I want a golden retriever. No offense to Calvin. To be fair he grew up with golden retrievers too so he probably gets where i'm coming from. My beautiful fluffy delinquent. So that's what we're working with at present. Over the course of this post it has become clear that I have a couple more boards to cultivate, and I certainly will be informing you when I make an actual Vision Board Vision Board, but I do also now have the added outlet that is Pinterest, which I am so into at the moment it is insane. I always thought it was just for mums and people who like DIY but then I started looking into it for work and now I have over a dozen boards for everything from Christmas and interiors to social media marketing. My semi-joke wedding board from 2015 also lives on. So. I should probably get to updating that soon amirite guys ha ha it's fine and normal as long as it's just on Pinterest. Innywho. I'm always harvesting phresh inspo, so let me know what your brain is feeding on at present, and I will see you with another thrilling post (no spoilers but it may involve a long awaited visit to a land far away) later this week.